TH E M R EP O RT | 53 O R I G I NAT I O N S E R V I C I N G A NA LY T I C S S E C O N DA R Y M A R K E T ANALYTICS THE LATEST Personalized Credit Counseling Leads to Rising Credit Scores Research shows those who attend even one credit counseling session have a better handle on their credit scores and are able to increase their scores. T ailored credit report and score counseling services are an effective way to reach consumers and improve their credit score, which can ultimately help them obtain a mortgage. 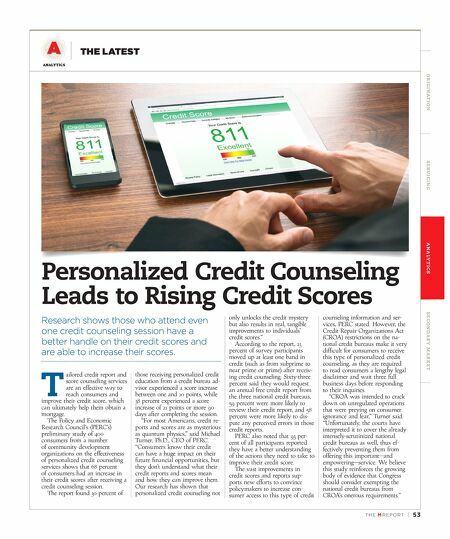 The Policy and Economic Research Council's (PERC's) preliminary study of 400 consumers from a number of community development organizations on the effectiveness of personalized credit counseling services shows that 68 percent of consumers had an increase in their credit scores after receiving a credit counseling session. The report found 30 percent of those receiving personalized credit education from a credit bureau ad - visor experienced a score increase between one and 20 points, while 38 percent experienced a score increase of 21 points or more 90 days after completing the session. "For most Americans, credit re - ports and scores are as mysterious as quantum physics," said Michael Turner, Ph.D., CEO of PERC. "Consumers know their credit can have a huge impact on their future financial opportunities, but they don't understand what their credit reports and scores mean and how they can improve them. Our research has shown that personalized credit counseling not only unlocks the credit mystery but also results in real, tangible improvements to individuals' credit scores." According to the report, 23 percent of survey participants moved up at least one band in credit (such as from subprime to near prime or prime) after receiv - ing credit counseling. Sixty-three percent said they would request an annual free credit report from the three national credit bureaus, 59 percent were more likely to review their credit report, and 58 percent were more likely to dis - pute any perceived errors in those credit reports. PERC also noted that 93 per- cent of all participants reported they have a better understanding of the actions they need to take to improve their credit score. 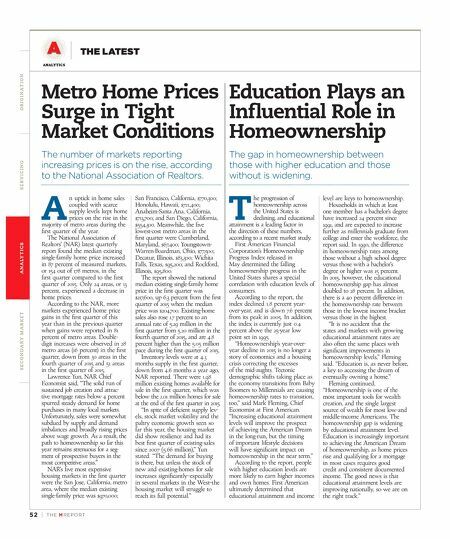 The vast improvements in credit scores and reports sup - ports new efforts to convince policymakers to increase con- sumer access to this type of credit counseling information and ser- vices, PERC stated. However, the Credit Repair Organizations Act (CROA) restrictions on the na- tional credit bureaus make it very difficult for consumers to receive this type of personalized credit counseling, as they are required to read consumers a lengthy legal disclaimer and wait three full business days before responding to their inquiries. "CROA was intended to crack down on unregulated operations that were preying on consumer ignorance and fear," Turner said. "Unfortunately, the courts have interpreted it to cover the already intensely-scrutinized national credit bureaus as well, thus ef - fectively preventing them from offering this important—and empowering—service. We believe this study reinforces the growing body of evidence that Congress should consider exempting the national credit bureaus from CROA's onerous requirements."